Who doesn’t love it? Fresh out of the oven, crusty, artisan bread slathered with butter, or drizzled with olive oil? Gimme all the bread. I mean it! It’s the perfect accompaniment to pretty much any main dish while also being just as satisfying on its own. It’s also the destroyer of diets with its carb filled goodness and an actual source of pain for the millions of people who are afflicted with Coeliac Disease or gluten intolerances. Historically, gluten free breads have been…well…sad. Dry, crumbly, tasteless, not to mention expensive. Thankfully, as time goes on and the demand for gluten free products increases we’re getting better at making do sans gluten without compromising taste and texture. This past week I’ve made more loaves of bread than I should admit. My bread baking frenzy won’t end here by any means – I relish the idea of trying out whatever variation I can come up with. What a perfect excuse to always have a fresh loaf of bread on hand? ours. This is dairy free, gluten free, and uses rice flour which is widely recognized as being a ‘safe’ starch. Since there is no gluten to over work, don’t be afraid of mixing this bad boy up. If you have a stand mixer, that’s perfect. If you don’thave a stand mixer, give yourself a good arm workout and put some elbow grease into it. I tried this out with an electric handheld mixer, and while it did eventually work, I wouldn’t use it again because my dough kept getting stuck. Your fully mixed dough will look very wet. The first time I made a gluten free dough, I was concerned I had messed up somewhere along the lines because my dough was sticky, wet, and needed to be spooned into my bread pans. I find this to be true with baking in general, but especially when working with yeast please make sure to use room temperature ingredients so that the yeast has the opportunity to rise properly. In your stand mixer or large bowl, stir together your flours, xanthan gum, and salt. In a medium sized bowl mix your hot water and sugar together, stirring occasionally until your sugar dissolves. If your water isn't warm enough, your yeast won't proof and your bread won't rise. Once the sugar dissolves, gently stir in your yeast. Let the yeast foam up for a few minutes. While the yeast is foaming up, beat together your three egg whites slightly. Pour the yeast mixture to the flour mixture and beat on high. Once the two mixtures are fully incorporated, add the egg whites, the oil, and the vinegar and continue mixing for about 3 minutes. Grease or line two loaf tins or one french bread pan and spoon your batter into each tin. Cover and stash in a warm place for at least 30 minutes. I like to stow my dough in the microwave for rising process because it keeps my dough free from drafts and disturbances. Our kitchen tends to keep cold, so that's usually my best option. After your dough has risen a bit (about 30 minutes) preheat your oven to 400F/ 200C. Bake for 40 minutes, turning the dough about half way through for an even bake. Remove from the pan and cool on a wire rack, unless you re like us and cut right in the second it's out of the pan. Viola! You have delicious, gluten free, homemade bread. Nutrition Facts are estimated based on ingredients and are not always accurate. *If you want a bit more fibre/protein you can substitute 1 cup brown rice flour for the white rice flour. If you’re following a Low Fodmap diet, I recommend sticking to white rice flour since brown has more fibre. While that’s great for most people, it can be extra work on the digestive system of those who already have GI problems. Made this tonight using 3 cups Bob’s Red Mill 1-to-1 Baking Flour (has xantham gum already). It came out so light, fluffy, and golden brown! Will definitely be making this again. The kids (teens) ate it up and had no idea it was gluten free. Yay – thanks Vanessa! So glad you liked it! That’s super helpful to know about the Bob’s Red Mill Flour too! Finally!! A gluten-free bread with both great taste and texture! My first attempt at this recipe turned out so well. The only changes I made to the recipe were to use 2 cups of brown rice flour and divide the sugars into 1 tbsp of honey and 1 tbsp of maple syrup. It slices beautifully and makes great crispy toasts for a charcuterie platter. This is going to be my go-to recipe! Hi Cheryl! That makes me so happy to hear – I’m so glad you like it! I have a gluten free 1 to 1 flour blend that contains: rice flour, brown rice flour, sorghum flour, tapioca starch, potato starch, cellulose, &xanthan gum. Can I use this for your bread, and if so, should I leave out the xanthan gum from your recipe? It’s really hard to say for sure how it will work without trying it myself – bread can be tricky to get just right. I do think it could work, but again I can’t say for sure. If you do end up trying it you can omit the xanthan since your flour blend already has it. If you do try it could you please come back and let me know how it went? I’m sure it would be really helpful to anyone reading through the comments in the future to see what they might be able to work with! I made this with a GF 1 to 1 flour blend that has xanthan gum (Cup4Cup). I still added xanthan gum, but 1.5 tsp instead of the 1 T the recipe calls for. I used a French loaf pan. The loaves were done after 30 minutes in the oven. Turned out great. That’s really helpful to know! Thanks for coming back to share that! I have been making Gluten Free bread for 15 years and this is the FIRST recipe that I have found that actually tastes an acts like bread. It is best fresh on the first day but if you happen to have any left over it makes the best toast ever. LOVE this recipe. That makes me so happy to hear – SO glad you enjoyed it! Thanks so much for coming back to let me know what you thought! If you use a flour that has the xanthan gum, can you omit it in the recipe? Also, has anyone tried using 2 whole eggs? We had a gluten free french bread at a local Greek Restaurant and it was absolutely the best! It was very eggy and sweet and heaven. Was hoping this recipe would be similar. Hi Cynthia! While I do think that you should be able to replace the rice/tapioca flour for a flour blend for this recipe I can’t guarantee that it will work out exactly the same since I haven’t tested it that way. If your bled does have xanthan in it already then you can go ahead and skip it here. As for the eggs – in know 1 whole egg would work fine but I’m not positive about two. I think it could work but it will probably make the dough more tricky to work with as it adds a lot of extra moisture. Found this gem of a recipe today and made it today. I just put the whole dough on a thick baking sheet formed it like a piece of french bread and baked it like instructed. Nice crunchy crust, soft and delicious on the inside. Was not dense at all. Definitely a keeper!! Even my gluten eating hubby liked it! SO glad you loved! This one is always a favourite in our house – I’d make it more often myself but then I just end up eating an entire load of bread on my own n 😀 Thanks so much for coming back to let me know what you thought!! I too am so excited about this recipe, having tried so many disappointing ones. It seems everyone not just the gluten intolerant, Love this bread! I or rather my tummy has a problem with the zantham gum so I substitute with a tablespoon of ground flaxseed and it works and also gives an added flavor. Thanks so much for sharing!!! That makes me so happy to hear! Thanks for sharing about the flaxseed too – that’s super helpful to know as a lot of people seem to struggle with xanthan. Thanks zan! Can you make this French bread with other flours, like Coconut or Almond flour? Before starting to make this bread, I read the recipe a million times. When I finished making the dough, the dough looked more like a cake batter, so I am quite nervous it will not be good and I would have just wasted all the ingredients. Time will tell if it’s good. That bread sounds right so far! That’s why I say in the recipe to scoop the batter into the bread pan – it feels strange but just keep with it! After the rising period and I carefully placed it in the oven, the loaves collapsed. It tastes wonderful and the texture is great but I don’t feel that I was completely successful because it doesn’t look so pretty. Oh no! I wonder if the loaves might have risen too much – that’s usually one of the reasons why breads collapses during or after baking. Glad you still liked it even though it didn’t come out right! This Bread is amazing! So light and soft. I am excited to make it again. Have you made it with any modifications? Ie brown rice flour? I’m so happy that I tried this recipe, thanks for sharing it. Great thanks Sarah, I will try it with brown rice flour too. I can’t say how excited I am about this bread, it was soooo good! I’m intolerant to tapioca. Is there anything that could be substituted? Would cornstarch work? Or potato starch? Any ideas? I’ve never tried it with any of these substitutes so I can’t say for sure but I think you might be able to get away with using arrowroot or potato starch without too much difference. I’m not positive about cornstarch – my understanding is that when it comes to baking with cornstarch you use about half the amount of cornstarch as you would other types of flour so I’m not sure how much that would change the recipe. I hope that helps! Perhaps oat flour or coconut flour? This bread is amazing! I love that I have found a recipe that meets all my food allergies that I can make on my own and stop spending $5-10 a loaf from someone else! However, a few questions – I’ve made this bread twice and today was more successful than the previous attempt, but I did notice a few of the same issues. The dough seems rather chunky, although it’s just the outside that remains chunky after baking. Is this because I mix by hand as opposed to a mixer? I know I’m not mixing “on high for 3 min”, but I am mixing it enough to blend it. Also, my bread isn’t fluffy, it’s light and delicious right when it comes out, but it doesn’t seem to get the air pockets that normal bread gets. I’ve tried using my own baking powder (every baking powder that I have access to has corn starch it, and I’m allergic to corn, so I’ve been doing 1/4 tsp baking soda and 1/2 tsp of apple cider vinegar (this equals 1 tsp of baking powder). The first time I did that and the 2nd time I doubled the amount and didn’t notice too much of a difference. I’m also curious about the amount of yeast. I’ve been told from wheat flour using bakers that 2 tbsp is a lot of yeast and that the bread should be light and fluffy with that amount. I let the yeast mixture rest for about 10 minutes today (as opposed to the 5 min the first time), and again, not too much of a difference. Any suggestions?? Hi Rachel! SO glad that you like the recipe! I’ll try my best to help you out here. As for the chunkiness, I’m not entirely sure I know what you mean by that. Are you talking about the smoothness of the bread after baking? I know the dough for this is a lot more batter like – if it’s baked without being smoothed down in places it can look a little chunky in some areas. It doesn’t really affect the taste, but it might not look as good. If that’s the case, just put a little oil on the back of a spoon and use that to smooth down the sides before baking. As for the the fluffiness, I think this is just one of those things that often gets lost when baking gluten free bread. To be honest I’ve never had a piece of gluten free bread (store, bought, homemade, or from a bakery) that I would say it comparable to regular gluten free in terms of lightness. As good as they may be, without the gluten creating nice little air pockets everywhere, it’s just not exactly the same. That’s why there’s more yeast in this recipe that you’d normally see in wheat based recipes. 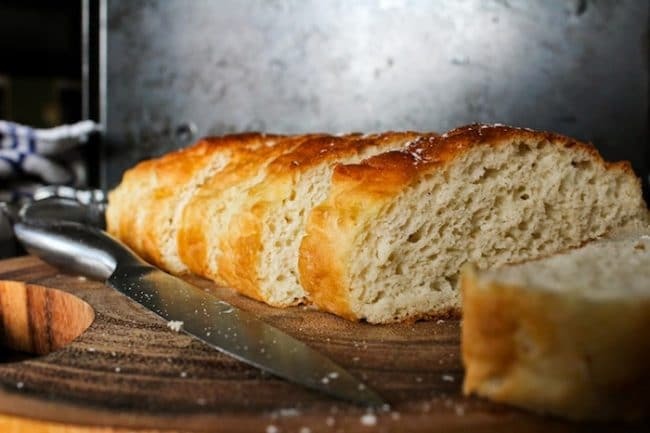 Since we’re working at a disadvantage here by not having gluten – the key protein that usually makes light and fluffy bread that also rises – the extra yeast is to give us a little more edge here. I hope that helps answer some of your questions, but please ask away if I didn’t quite cover it here! That does help! I have had two gf breads that are light and fluffy, so it is definitely possible (somehow!). But your pictures show light and fluffiness whereas mine didn’t quite get that airy. That is sort of what I mean by chunky – I’ve tried to smooth it out, but it didn’t quite work. I got the impression it might need more liquid, since the dough was just so sticky and I couldn’t get it smooth. I was afraid to add water to the dough in case it ruined the entire thing! Rachel did you use psyllium husk powder? I did, and my dough was SOOOO ‘chunky’ that I couldn’t spread it. I read in one of the comments on this thread that you should add 1T water for each teaspoon of PHP, so I took the lumpy dough out of the pans and stirred in 3 T of water. That helped SO MUCH!!!! The bread is fabulous, but would have been awful if I hadn’t happened to have read that. This is the best bread ever! I’m really happy with the recipe. I avoid making it too often because I can eat it by myself in just one day! I love the crust, super crunchy in the cast iron pan, and the inside is really soft! We love it! I know what you mean! This never lasts more than a few hours when I make it so I always make sure I’ve got people to share with otherwise 🙂 I’ve never though to put it in a cast iron pan before – I’m going to do that next time! Thank you! Hi Vicki! You only need to beat them enough to make them a little bit foamy on top with a few bubbles on top. Hope you like the bread! Brown rice flour is totally fine! I use that sometimes instead of white if I’m ever out. I’d also recommend using the regular beaters since the batter is usually really wet before baking. Hope you like it as much as we do! Has anyone tried this recipe with cup4cup flour or any of there other ready made gluten free sp flours? Hello this bread look delicious, i would love to do it. I have IBS and i cant eat eggs what is the best to substitute eggs ?? As for the xathan gum, I’ve never tried this without using xanthan, guar gum or psyllium husk (which is also probably hard to source). Have you tried looking it up on Amazon? I sometimes have to buy things there that I can’t easily find in the UK. My first time making this bread today. I wouldn’t call it an epic fail, but I would do things differently next time.the recipe is great. This was just a bad choice of pans. I used a double baguette pan. Seemed like a good idea at the time. The bread didn’t rise much before going into the oven, so I thought it was safe. Wrong. The bread doubled in size in the oven. The outside, especially the top, got too well done, and the inside was not done. Not wanting it to go to waste, I cut it into pieces 2-3 inches long and put them on parchment on a cookie sheet, back into the oven at 325. For 12-13 minutes longer. Better, but still not what I wanted. The dough was a great consistency. I believe next time I will try just shaping I into a loaf or two on parchment on cookie sheets. Hoping that wil work. Oh no! Sorry things got messy with the pans – I’ve been there! I hope next time it works out better for you! Recipe is very good, a couple of times I’ve made,very good taste. But I have one question,how can I replace xanthan gum with psyllium husk? whether they should mingle with hot water the psyllium husk? Hi Valerie! I’m glad you like the bread! To be honest, there are times when I just toss the psyllium husk into the dry ingredients just as I would with xanthan. It’s a 1:1 substitute so it’s pretty easy. The best way to incorporate psyllium according to what I’ve read other people do is to mix it with water until it gels up and then add it into the bread dough at the end. So in this case you would mix 1 teaspoon psyllium with 1 tablespoons water, whisk it together and place in the fridge for about 5 minutes. It will become thick and gel like and you can just mix that into the rest of the dough. I don’t think there should be an issue mixing the psyllium with the warm yeast water, so no worries about that. Hope this helps! I’m wondering how you store this and how long it’s good for? I just tried this without eggs for my wife who is gluten intolerant and allergic to eggs. I replaced the eggs and xanthan gum with psyllium husk powder (4 tablespoons total), and put it in while the oven was warming up to get a thicker crust. I ended up adding a bit more water because the dough was so thick. It held together just like wheat dough and I could work it with my hands easily. I made baguettes and they came out great – the crust was perfect, but the centre was a bit doughy. Next time I’ll use less psyllium so I don’t have to add as much water. Ooh, I’ve never tried replacing eggs with xanthan and psyllium alone. I’m going to try that out myself. The problem I usually run into with gluten free bread is that you can’t handle it too much. Thanks for sharing! I’m glad you liked it! I can never wait for the bread to cool down after I take it out of the oven.. that’s when it is the best. this looks amazing. Same! When the butter is all melty….ooh it’s the best! This looks delicious!! I’d like to make this for a friend but they also happen to have an egg allergy – any idea of what to substitute for the egg whites? Hi Lisa! I can’t say for sure because I’ve never tried it for myself, but I was listening to a podcast from America’s Test Kitchen just this week where a person called in asking about the best egg substitutes in baking because she had an egg allergy. They recommended the brand Egg Beaters as being the best one – if you do try that do it as if you are replacing 1 whole egg rather than 2 egg whites. Let me know how it goes or if you find another suitable substitute! I have to point out here that Egg Beaters IS still eggs, just the whites without the yolks, so if you are actually allergic to egg whites or the whole egg, this would not be an appropriate substitution. I know flax or chia “egg” can be substituted in many recipes, but I wonder if it would significantly change the end result in this one. Oooh, sorry about that! Since they were talking about egg substitutes I assumed egg beaters wouldn’t actually be eggs – my bad! I just found this article from the Kitchn about vegan egg replacers and Ener-G sounds like it could be the closest thing.Thanks for pointing that out to me! you can try a flax egg. 1Tbsp ground flax with 3Tbsp warm water. Mix it up, let it gel a bit and mix in. I have no idea if it could successfully be substituted in this recipe but I have used the water from a can of chickpeas (called aquafaba) to make meringue cookies, and coconut macaroon. So, she may want to experiment with that. There are also egg replacer powders that you can find at health food store, usually by the flours. Oooh I’d be really interested in trying that out myself. I just heard about aqua faba last week and how you can use it as an egg free meringue so I wonder how well it would work as egg whites in other situations. Thanks, Jessica! Can you share those recipes using aqufaba, please? Hi Lisa! Sorry this comes a bit late, but I’ve just posted a new recipe for this bread using aquafaba (the water from chickpea cans) based on another commenter’s suggestion and it works wonderfully if you’re still interested in trying an egg free version. That looks delicious ? I was just wondering what kind of loaf pan you used? It doesn’t look like it came out of a loaf pan. It’s long and browned on all sides which I love. It almost looks Loire it was baked in a French loaf pan. Thanks Dawn! I wasn’t sure the exact size so I just measured the pan I used and it’s an 9in x 5in pan which gives me a wide loaf. I have since done this in a French loaf tin and I really like how it works with that as well – it comes out a lot longer in length and smaller around the middle which makes it great for sharing since it goes further than way. Let me know if you have anymore questions! Oh my goodness gracious this bread is amazing. Not even 5 minutes out of the oven and I know this will be my go-to. I put some of the dough in an 8×8 pan with some garlic powder and Italian seasonings and it made delicious foccacia bread. Thoughts on making this into a thicker pizza crust? The texture is perfect but the dough may be too sticky. Hmm…. This recipe is bette hagman’s from more from the gluten free gourmet cookbook. Ive been making it for years and it is good. Better in a french bread pan. this might be my heaven! YES! i so can’t wait to make my own. with SOUP! Thanks, Lindsay! A chunk of this and bowl of soup is my idea of heaven for sure! Delicious! Mine isn’t rising as much as yours looks like it does though… any ideas what I could be doing wrong? As far as I can tell I am making the recipe exactly as shown, and tried both glass and regular loaf pans. Thank you for the yummy recipe! Hi, Yvonne! So happy you like the recipe! A couple things you could maybe adjust for next time: Whenever I make this, I always warm up my water for the yeast to a temperature between 80F/90F – I did it once and didn’t use warm enough water and I just couldn’t get a rise out of it. If your yeast begins to foam slightly after the water, sugar, and yeast sit for about 3-5 minutes then it should be alright. Another thing – someone on pinterest tried this and told me that she added 1 teaspoon baking powder (baking powder helps baked goods rise up as opposed to baking soda which helps baked goods spread) to give it an additional rise and that worked out for her. So fluffy and fresh, love it! I am yet to try gluten-free baking. This recipe sounds easy. I am book marking this for future reference. 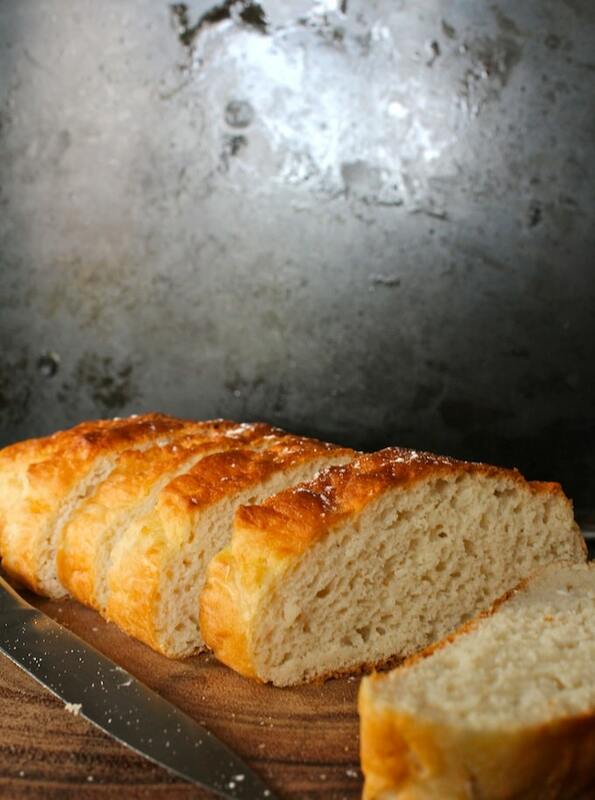 As far as gluten free breads go, this one is a breeze – you’ll love it! I love baking bread – there isn’t much that beats smothering a piece of hot bread with a bit of butter and eating it still warm from the oven. As far as gluten free breads go – this ones is my favorite. Even the gluten eaters in my house like it! 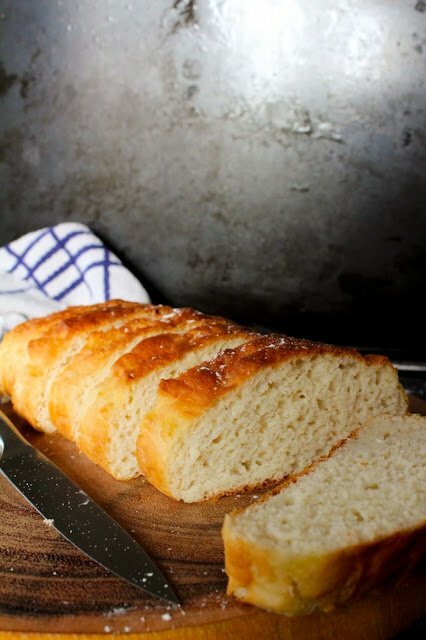 Gluten free French bread, this sounds interesting and looks great. Thanks for sharing. Baking bread is one of my favorite things to do – it’s been such a learning curve making gluten free breads. Hope you like it! I have to do a lil shopping for this recipe. Am not sure where to get the xanthan gum. I liked the tips..i usually use yeast in room temperature with a lil sugar to activate it thoroughly. wow! saved to try asap!